French Art Deco bronze door handle, France, circa 1925. Ivy pattern. Solid bronze. Original dark brown patina. Measures: Height 10.2" (26 cm), width 4.3" (11 cm), 6.7" (17 cm) between both holes. Marked "Bronze" (see photo). Pair of sculptural bronze art door handles, 1960s. 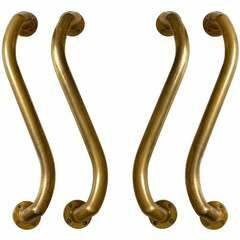 Polished bronze free-form door handles in the classical style.